You don't see much news coming out of Venezuela these days. The government there has stopped releasing most economic data, and then, what reporter wants to ferret out the facts by volunteering for the Venezuela beat? But yesterday the Wall Street Journal ran a big front-page story with the latest economic news from Caracas. 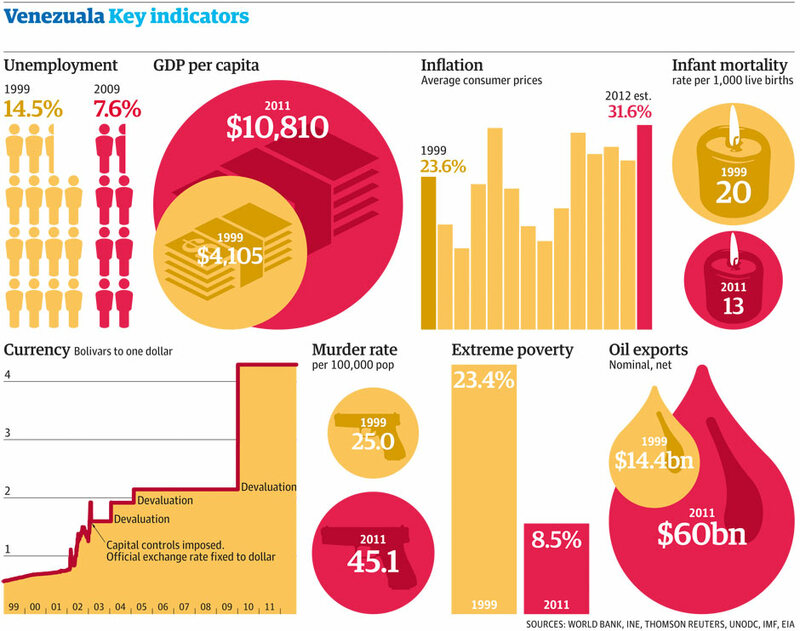 Maybe you thought Venezuela had hit rock bottom a year ago, but as you will see, it has in fact gotten yet far worse. Still, they probably have some ways to go before achieving the final end game of socialism, à la North Korea. Today I'm going to combine some passages from the WSJ report with a reprise of a post I wrote a little over a year ago, December 2016, titled "Venezuela: Useful Idiots Roundup." In that post I collected a good sampling of quotes from progressive idiots uttered between 2007 and 2015, each praising the great success of the Venezuela/Chavez economic model. The quotees include the likes of Bernie Sanders (of course) and of Hillary's favorite economic advisor, Nobel Prize-winning economist Joseph Stiglitz. Many of the quotees hold out Venezuela as a model for the U.S. Really. Nor have I seen a one of them later walk back their words. They just move on to other causes and hope the whole thing will be forgotten. In the New York Times and Washington Post and ABC/NBC/CBS/CNN/MSNBC, it will be forgotten. But not at the Manhattan Contrarian. Crude oil production fell 12% in December from the month before, according to government figures released Thursday. Over all of 2017, output was down 29%, among the steepest national declines in recent history, driven by mismanagement and under investment at the state oil company, say industry observers and oilmen. The decline has been exacerbated by a management purge at state-run PdVSA by Mr. Maduro that has paralyzed the oil giant. Seventy senior managers have been jailed on graft allegations in the past three months. Generals with no industry experience have been named to run the firm. And how's the rest of the economy doing? Over the past four years, the country’s economy has shrunk by about 40% and inflation has surged—topping 2,600% last year, according to the National Assembly. Nearly one in four factories didn’t reopen after Christmas, according to a local industry association. And the overall picture for the people? Malnutrition is spreading among the young and elderly, while health officials report a resurgence of illnesses ranging from malaria to diphtheria. Meanwhile social stability is fraying. At least four people have died during outbreaks of looting in recent weeks. While democratic socialism may sound utopian in the European context, and positively unimaginable in the United States, there is [in Venezuela] a viable alternative to the neoliberal model in existence. It is incumbent on the left to think seriously about what can be learned from the Bolivarian revolution. That revolution can provoke us to imagine an alternative to capitalism, whether through forms of freely-associated producers planning and allocating the social wealth, syndicalist and Marxist forms of socialism, or self-governing popular assemblies or autonomous communities. For more than a decade people opposed to the government of Venezuela have argued that its economy would implode. . . . How frustrating it has been for them to witness only two recessions: one directly caused by the opposition's oil strike (December 2002-May 2003) and one brought on by the world recession (2009 and the first half of 2010). However, the government got control of the national oil company in 2003, and the whole decade's economic performance turned out quite well, with average annual growth of real income per person of 2.7% and poverty reduced by over half, and large gains for the majority in employment, access to health care, pensions and education. [Chavez] brought hope to a continent. . . . [H]e has not only helped to construct and project Venezuela as an interesting and important country for the first time, at ease with itself and its historical heritage, he has reimagined the continent of Latin America with a vision of what might be possible. The American people have grown accustomed to hearing the Venezuelan president referred to as a dictator, not only by media representatives but by members of the leadership in both parties. This is a defamation, not only to President Chavez, but also to the majority of Venezuelan people, poor people who have elected him president time and time again. This is not a dictator supported by the wealthy classes, but rather, a president elected by the impoverished and at the service of the Venezuelan constitution, a document not unlike our own. He is a flamboyant, passionate leader. Venezuela's economic growth has been very impressive in the last few years. . . . Venezuelan President Hugo Chavez appears to have had success in bringing health and education to the people in the poor neighborhoods of Caracas, to those who previously saw few benefits of the countries oil wealth. I have checked the links, and they are all still good. So how could it have been that everything seemed to be going so well for so long for the "Bolivarian Revolution," and then it all fell apart? The short answer is that the government controls the economic statistics. It can pretend for a decade or more that the economy is growing when it is not, generally by a combination of (1) hugely increasing government spending and counting that as a 100 cents on the dollar increase in GDP and (2) outright fraud. When the collapse becomes too obvious to paper over any more, they just stop putting out economic information. For a longer explanation of how the "socialist death spiral" works, see my post here.